Saints of Valory traverse a wide range of international influences and this is quite apt because the band’s music has rapidly disseminated to an eager international audience that has been consuming its upbeat alternative rock since the release of its incipient EP The Bright Lights in November 2010. Formed in Brazil in 2008, Saints of Valory is the product of a childhood friendship between Gavin Jasper (lead vocals/bass) and Godfrey Thomson (guitar/vocals), who pair awesome names with serious musical talent. Gerard Labou, a French drummer, was brought in by Thomson, and, craving a space to rehearse, the band of three contacted a well-travelled friend named Stephen Buckle, the band’s current keyboardist/vocalist, who had a small studio in his home in Texas, and relocated the operation to the Lone Star state. After the release of its second EP in 2012, the band was recognized by Billboard as one of the Top Unsigned Artists in 2012, and it was quickly snatched up by Atlantic Records, where it released its label debut, Possibilities, last summer. The music has spread like wildfire. As I write this post, the band is currently touring the U.S. with Eric Hutchinson (coming to NY on May 19 at Irving Plaza), and it should come to no surprise that it is gaining new fans everywhere it goes. Good music is good music, and people recognize it quickly. 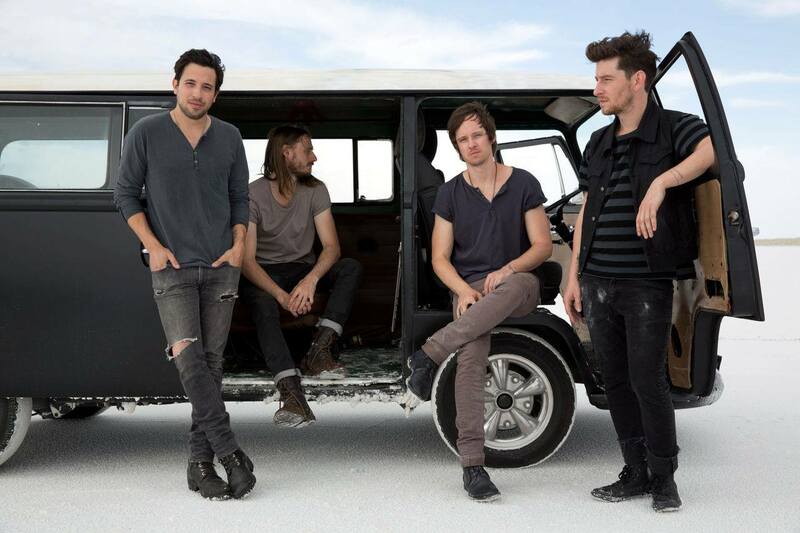 Saints of Valory plays excellent tunes, and if you don’t believe me click play on the embedded videos below. “Kids” begins with a drowned guitar and heavy percussion that saturate the listener in a full array of sound immediately. The vocal carries over the instrumental effortlessly. It is strong and matches the instrumental like macaroni goes with cheese. A full-bodied harmony introduces a neat riff. The rhythm calls out to bands like Airborne Toxic Event and Imagine Dragons. Saints of Valory’s harmony, though, is unique. It is almost choral – kind of like Bastille but less chanty – and it just bursts into a killer sing-along style that the listener cannot help but get into. “Long Time Coming” has a cool, American Authors feel. The rhythm is infectious. This is perhaps the strongest component of Saints of Valory’s music – the rhythm. It’s toe-tapping, head-nodding, get on your feet and join the chorus, type of music. It is no surprise that the band has garnered a large collection of diverse music fans. The music is fun, exciting, and effervescent. It is just excellent alternative rock, and I cannot wait to witness the successful progression and growth of this band. You can track it to by visiting the band’s pages.